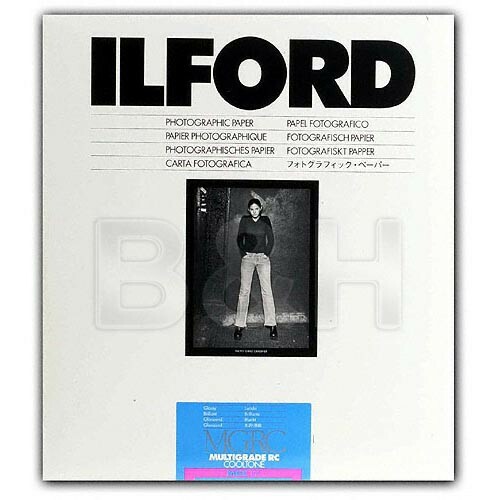 This is a 50 sheet box of Ilford Multigrade Cooltone RC Paper. It is a premium quality, variable contrast resin-coated paper, cool-of-neutral image tone on a cool white base. Multigrade Cooltone RC has a standard weight (190g/m2) resin coated base. Multigrade RC Cooltone is part of the Ilford Multigrade system and is fully compatible with all existing multigrade filters and equipment. It is suitable for printing all black and white negatives and with all enlarger types. Box Dimensions (LxWxH) 15.0 x 11.85 x 1.0"